In the media coverage of the flooding in Cumbria and Lancashire there has been some scrutiny of government spending on flood defence, with a claimed cut this year of around of 15% (eg). This is basically true (capital spending is likely to fall by 17% and total spending provision is down 14%, both figures in real terms), though on the one hand it follows unprecedentedly high expenditure last year, but on the other, significantly reduced spending over the middle of the last parliament. The chart below shows government capital expenditure on ‘flood and coastal erosion risk management’ adjusted for inflation (see annex for details). Spending was cut sharply in the second year of the coalition, then rose only marginally in the next two years, but was then increased sharply in 2014/15. Spending is being cut this year, in real terms by 17% and in cash terms by 16%. Spending in 2015/16 will be back just below the level of spending inherited from Labour in 2009/10, when over the same period the economy has grown by around 13 per cent (with a projection for 2015/16). 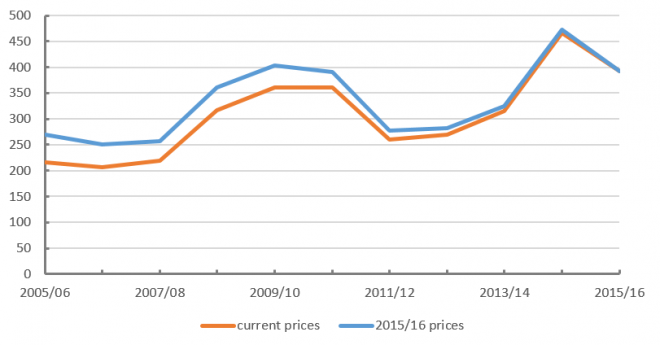 The devastating scenes from the north-west show these spending cuts as the most obvious false economy (Simon Wren-Lewis has also addressed this – here – my figures are a little more up to date). While the scale of the rainfall was apparently unprecedented and I don’t know whether it is possible to build flood defences adequate to any circumstance, reduced spending over most of the past five years must have hindered the chances of proper protection. The public sector is now faced with a bill for roads, railways and bridges, and private insurers a payout apparently in the vicinity of £200million (according to the Today programme yesterday morning; though it is not clear what share of residents are insured given the hefty rise in premiums after the last disaster), and there is also any shutdown of economic activity. It is notable that the estimate of the costs to insurers is pretty much double the cumulative reduction in cash spending from 2009/10. It is hard to think of a more compelling example of the need for proper and adequate infrastructure spending. Infrastructure spending is essential not only to the well-being of the economy, but of society and communities. On an even more fundamental level, the issue is directly related to adapting to climate change. For many of those meeting at COP21 in Paris these challenges cannot be met without large scale infrastructure spending on green technologies. The government’s official watchdog on these matters, the Committee on Climate Change (CCC), has said that if global warming advances past 2 degrees, infrastructure spend will not be sufficient to completely offset the consequences. Assuming world governments agree to the 1.5-2 degrees ceiling, the CCC estimates that the government’s adaptation plan, including planned infrastructural investments, could mitigate the effects of flooding by up to 50 per cent (see here). The figures are from a Department for Environment, Food and Rural Affairs report on ‘Central Government Funding for Flood and Coastal Erosion Risk Management in England’, dated December 2015 (here). The main data are shown below; I have used only the figures for capital spending, adjusting for inflation in the same way. 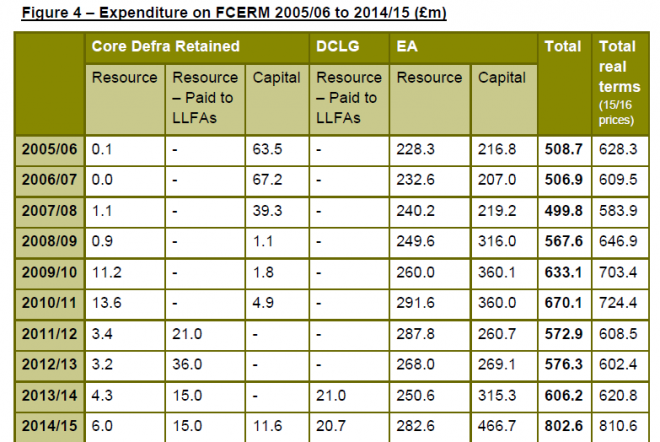 For 2015/16 the DEFRA release does not include capital spend figures, these are taken instead from the formal supply estimates of government spending. For DEFRA voted expenditure under the sub-heading ‘protect the country from floods’, planned capital spending in 2015/16 is £383m, down from ‘provisions’ in 2014/15 of £490m. In fact this is a reduction of over a fifth (21.8%) though the figures in the main text show a cash reduction of 16%, presumably because the allocation in 2014/15 was underspent. A subsequent table gives only a total figure for 2015/16 of £695.3m in both current prices and real terms (because the latest year is the reference year). On this definition total spend fell by 13% in cash and 14% in real terms. Work areas: Economy and Industry, Inequality. Tags: austerity, economic alternative, infrastructure, investment, politics.